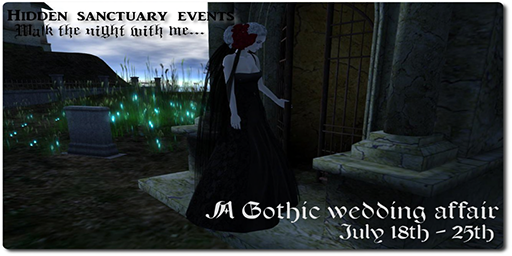 Walk the Night With Me is a Hidden Sanctuary Event centered around all things Gothic Wedding and Dark Love. It takes place July 18th through the 23rd, and will feature all things dark and sticky. A Gothic Wedding is one that evokes romance with a Victorian flare. Avatar Bizarre is thrilled to be a part of this event, and will be debuting two new items, which will exclusive at the event until its end, then they will be released to the Marketplace and in the Main Store location afterwards. The first of these items is the Evelyn, pictured above. This gown is a lovely Victorian-style garment with a black leather corset, frilly black lace accents at the throat and the wrists, and sumptuous puffed sleeves. The floor-length skirt is slim, and drapes gorgeously, ending in a lovely sweep on the floor. The tiny hat adds that Brontean touch, and is finished off with black lace attached to the brim. As always, all rigged mesh items can be tried on with a handy free DEMO. This is available in six colors, and includes five sizes and the hat.